Since the day you installed it, your fridge works without a break. It doesn’t matter how expensive or dependable brand you have, it can still quit working for some reason. When it happens, get help of professional refrigerator technicians of Vancouver by calling our company. We are well known for our quick and accurate service. All the techs we dispatch are trained and experienced in every aspect of refrigerator repair. Whatever your problem is, you can expect to get the most efficient solution for your needs! 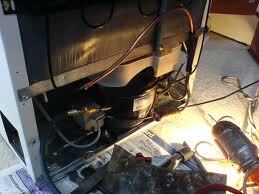 Modern refrigeration appliances consist of many components that can break at a certain point in time. When your unit stops operating, it’s vital to take a fast action. If you are in the Vancouver region in British Columbia, contact our company right away! Here at Appliance Repair Vancouver, the fridge pros have seen all possible breakages. With years of hands-on experience, there isn’t a single problem they can’t handle. Whether your unit is not cooling properly, cooling too much or leaking from the bottom, they will get it back up and running again. With the help of professional equipment and genuine parts on hand, the refrigerator technicians can complete any job in a single stop. Like any other home appliances, your fridge needs proper care and maintenance. To avoid unexpected fridge repairs, turn to our company for preventative service. The Vancouver fridge techs will check your appliance on a regular basis to ensure it runs as it should. By calling us at least once a year, you can rest easy knowing that no major problems are about to affect your unit. Whenever your fridge starts playing up, our company is at your disposal. In most of cases, we can dispatch the pros within the same day of your call. Give us a ring today and the refrigerator technicians of Vancouver will be there in no time!